Avery Bernholtz and Ella Haverkampf in 1st and 5th, respectively, on the overall podium 12-14 ski girls. The IFSA Junior North American Championships in Kirkwood last weekend wrapped up the competitive season for the local freeride athletes. Crested Butte was represented by 11 athletes in a tight field comprised of the top 10% of IFSA athletes based on their overall ranking. The stakes were high as many athletes were striking distance for overall champion. Brooks Hudson was tied for first for the 12-14 boys ski division after maxing out his possible scores with consistent 1sts at 4 events including our local events. Avery Bernholtz and Dagan Schwartz had also maxed out their points going in to NORAMS in their respective 12-14 ski girls and snowboard boys divisions. Carson Hildebrandt and Kye Matlock were also in the top 5 going into the event in the 12-14 ski boys and Jon Clay Patterson was in 5th in 15-18 ski men. The weather did not want to cooperate for the first 3 days of the event as is dumped 2-3 feet in places and the venues sustained 100 mph winds. After it was all done, the event organizers were able to run a 1-run event on the legendary Cirque venue, a permanently closed area of the resort that had yet to be used for a junior event. 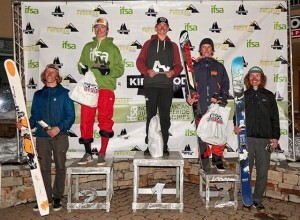 Dagan Schwartz won the 12-14 Boys Snowboard. After a great season at CBMR that allowed athletes to train all over the mountain, our athletes were ready to throw down on the big features and steep terrain on the cirque. The level of skiing and riding was very high across all the divisions. Athletes from all over the western US and Canada, and even a few East Coasters, all threw down consistent runs stomping big airs with strong technical descents. On the girls side, local CBCS freshman, Avery Bernholtz, kicked off her run with an awesome straight line that put her in 2nd place for the event. 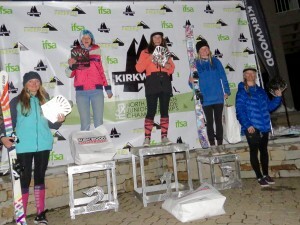 That sealed the deal for her overall championship in the 12-14 girls ski division. Thirteen year-old Ella Haverkampf wasn’t far behind in 6th place for the day after beboping off some features and that moved her way up into 5th place overall on the season. 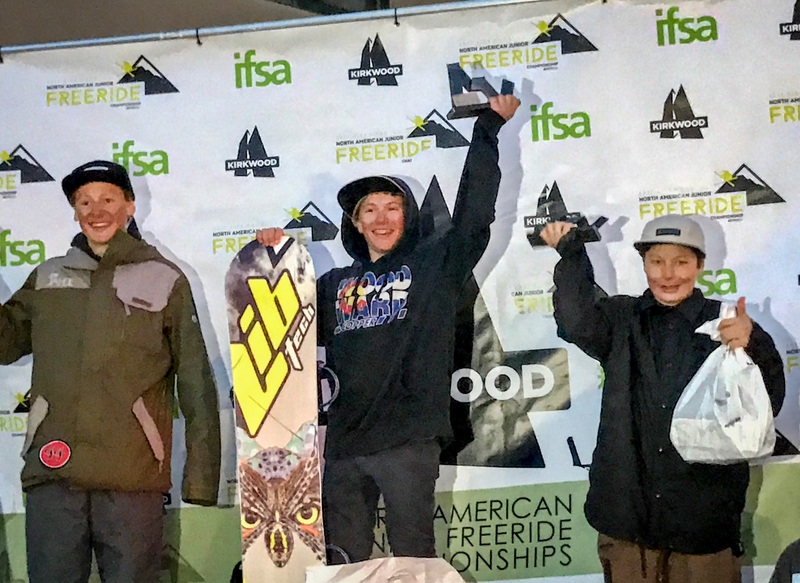 Dagan Schwartz was able to ride to the victory exemplifying his consistent, technical snowboarding and mixed in a 360 and a method off some airs. 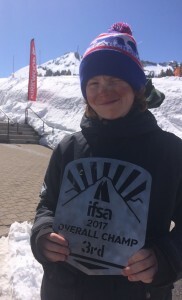 Many of the snowboarders in his division weren’t able to keep their runs clean and Dagan secured the overall 12-14 snowboard boys champion after taking 2nd last year. Brooks Hudson captured 3rd overall in 12-14 boys ski. The 12-14 ski boys were skiing like they had something to prove and they knew they had to have perfect runs to keep pace with the competitive field. The strongest run of the local contingent was laid down by Holden Bradford, who kept his fluidity in the top section and found jumps to hit before capping it off with the biggest air in the bottom section of the day; he finished 4th and moved up into 10th overall. Carson Hildebrandt, Kye Matlock, and Brooks Hudson all had great, aggressive runs, but the smallest deductions in fluidity and control had big impacts as the boys finished mid-pack in 15th, 21st, and 22nd respectively. After these results Brooks took 3rd overall while Carson and Kye finished in 8th and 9th, respectively. Rowan Featherman, probably one of the youngest competitors at the event after his first year competing in freeride, was able to secure 30th with a fun run and moved up to 30th overall on the season. Seve Petersen unfortunately crashed at the end of his line after sending it a little too big. Jon Clay Patterson on top of the 15-18 Ski Men podium; he’s 16. In the 15-18 ski men division Turner Petersen and Jon Clay Patterson were eager to throw down on the Cirque. Turner Petersen had his best run of the season going after sticking a high speed double at the top and stomping a 3 off a 20-25 foot feature. His bottom air didn’t go as planned, however, and similar to his younger brother he landed too far in the back seat to maintain control. Jon Clay kept his game locked tight and ascended to another level when it was his turn to drop. He had a massive 30-foot feature off the top of the ridge and then 3’d the same air Turner did, hit a fun, smaller transistion air before dominating his bottom air that hit like a 60-foot park jump. JC’s technical prowess and angulated turns between his large features made the difference and he finished on top of the podium amidst the best skiers in the US and Canada. With some of the other top athletes not sticking their runs, JC rode the points from the victory to Overall Champion in the 15-18 Ski Men division. This is the first time a skier from the Rocky Mountain division has taken the top spot overall since eventual Freeride World Tour champion, George Rodney, did it in 2012. The event capped off such an incredible season for these young athletes. All the CBMST and local athletes look forward to building on their success next year and hopefully we get another bomber snowpack to match their enthusiasm.